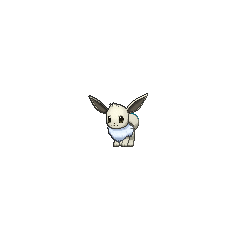 Eevee in game: 12,136 Who? Important notice! Pokemon Eevee is a fictional character of humans. Eevee (Japanese: イーブイ Eievui) is a Normal-type Pokémon introduced in Generation I.
Espeon when leveled up with high friendship during the daytime, including morning (Generation II onward, excludes areas with a Moss Rock or Ice Rock), or when leveled up with high friendship with a Sun Shard in the Bag (Pokémon XD). Umbreon when leveled up with high friendship during the nighttime (Generation II onward, excludes areas with a Moss Rock or Ice Rock), or when leveled up with high friendship with a Moon Shard in the Bag (Pokémon XD). Leafeon when leveled up near a Moss Rock (Generation IV onward). Glaceon when leveled up near an Ice Rock (Generation IV onward). Sylveon when leveled up with a Fairy-type move and 2 Affection hearts in Pokémon-Amie or Pokémon Refresh (Generation VI onward, excludes areas with a Moss Rock or Ice Rock). Eevee is the starter Pokémon for the main characters of Pokémon XD: Gale of Darkness and Pokémon Conquest. It is also the rival's starter Pokémon in Pokémon Yellow, although Professor Oak originally intended to give it to the player. May received an Egg from a Daycare Worker in May's Egg-Cellent Adventure. The Egg hatched into an Eevee in Time Warp Heals All Wounds, and evolved into Glaceon before May met back up with the group in A Full Course Tag Battle!. Serena caught an Eevee in A Frolicking Find in the Flowers!. It later evolved into a Sylveon in Party Dancecapades!. Gary's Eevee debuted in The Rivalry Revival, defeating Ash's Pikachu. It evolved into an Umbreon some time before Power Play!. Two Eevee appeared in Last Call — First Round!, under the ownership of Ursula. Both of them evolved during her performance, into a Vaporeon and a Flareon. 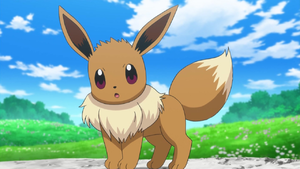 An Eevee, along with her evolutions, appeared in Team Eevee and the Pokémon Rescue Squad!, under the ownership of Virgil. Another Eevee, also belonging to Virgil, was also briefly seen in a flashback, eventually evolving into his Umbreon. An Eevee appeared in Eevee & Friends with its evolutions, including the newly introduced Sylveon. Three Eevee appeared in Mystery on a Deserted Island!, in which they evolved into Vaporeon, Jolteon and Flareon. In Oaknapped!, Ritchie consulted Professor Oak on advice on what evolved form is best for his Eevee. However this was only mentioned in the dub and it is unknown whether he owns an Eevee in the Japanese version. An Eevee appeared in Genesect and the Legend Awakened. A Trainer's Eevee appeared in A Battle of Aerial Mobility!. An Eevee appeared as a statue alongside an unknown trainer, Palpitoad and Golurk in Awakening the Sleeping Giant!. An Eevee appeared in Diancie and the Cocoon of Destruction. An Eevee appeared in a flashback in Bonnie for the Defense!, where it was taken away from Heidi, Kye, and Jay by their teacher who told them they are too young to have a Pokémon. An Eevee appeared during Mega Audino journal in A Race for Home!. An image of an Eevee appeared in A Performance Pop Quiz!. Two Trainers' Eevee appeared in Alola to New Adventure!. A Trainer's Eevee appeared in The Guardian's Challenge!. Five Trainers' Eevee appeared in SM006. EP040 Eevee Ash's Pokédex Eevee, the Evolution Pokémon. It has the potential to evolve into any one of three different Pokémon. DP174 Eevee Dawn's Pokédex Eevee, the Evolution Pokémon. Eevee is a unique Pokémon that can adapt to its environment by changing its form and abilities when evolving. BW102 Eevee Ash's Pokédex Eevee, the Evolution Pokémon. Depending on circumstances, Eevee can evolve into many forms. XY089 Eevee Serena's Pokédex Eevee, the Evolution Pokémon. Eevee is rarely seen, and can adapt to severe habitats by evolving, changing its capabilities and form. An Eevee appeared in File 1: Red with Professor Oak. Like in the anime, Mikey owns an Eevee in the The Electric Tale of Pikachu manga. Mikey and his Eevee appear in the chapter To Evolve or Not to Evolve, That is the Question!. An Eevee is owned by Coconut in Magical Pokémon Journey. This Eevee is a smart Pokémon who is very loyal to Coconut. Later in the series, another Eevee named Lu appears. Coconut's Eevee falls in love with Lu, who confesses her own love to Eevee before moving away. In Blame it on Eevee an Eevee is seen as a Pokémon experimented on by Team Rocket, in their tests to attempt merging Articuno, Zapdos, and Moltres into a single Pokémon. The experiments gave Eevee the characteristic of being able to mutate into three of its evolved forms, namely Vaporeon, Jolteon, and Flareon and revert, though it still requires the energies of an evolutionary stone. 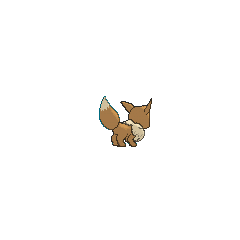 Red eventually captures this Eevee as a prerequisite for challenging Erika and gave it the name Vee. When it evolved into Espeon, however, it lost its mutation ability and became unable to revert to its base form. Yellow fantasized about Pokémon that could evolve via stone in The Kindest Tentacruel which an Eevee was one of them. 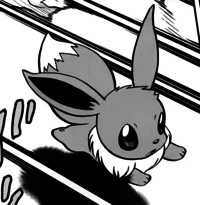 Another Eevee was seen under the ownership of Karen, during her childhood as one of the children captured by the Masked Man. It is presumed that this Eevee eventually evolves into her Umbreon, which she used to fight Green. Y caught an Eevee, which she named Veevee. When she used her in a battle against Team Flare, she evolved into a Sylveon. An Eevee is seen with Red during the curry cooking competition that went on in Curry Showdown! Which is the Most Delicious?. Mitsumi has an Eevee as seen in Clash! Hareta vs. Mitsumi!!. PS059 A rare Pokémon with an irregular genetic code. Able to evolve into any of three highly distinct, advanced forms. As in the games and anime, Eevee is notable in the TCG for being able to evolve into the most differently-named Pokémon cards, with its eight normal evolutions, as well as Dark forms of the Generation I evolutions and Espeon, and Light forms of the Generation I evolutions. One Eevee figure has been released. Eevee only appears as a random trophy. As adaptable a Pokémon as any yet discovered, Eevee's evolutionary progress changes to meet the conditions of its environment. So far, five evolutionary forms have been discovered and then catalogued for this unique Pokémon; Vaporeon, Jolteon, Flareon, Espeon, and Umbreon. All evolutions have special benefits. Eevee appears as a Poké Ball Pokémon. It uses Take Down to hit opponents. NA: This Normal-type Pokémon is as adaptable to evolution as they come, with eight evolutions discovered thus far. If you pair that potential with its adorable features, it's no wonder Eevee is so popular! In Smash Bros., Eevee will attack a nearby opponent with Take Down. Sadly, this attack isn't incredibly powerful. PAL: This adorable Normal-type Pokémon's ability to evolve in so many different ways makes it a popular choice with trainers. When brought out in battle, Eevee uses Take Down on the first opponent it sees, but...it's not very effective. Never mind. Eevee may not be the toughest Pokémon, but it'll always be one of the cutest. Pokémon Stadium 2: Eevee stars in the mini-game "Eager Eevee". Its genetic code is irregular. It evolves into three kinds of Pokémon when exposed to the radiation of elemental stones. SM Pokémon Center Birthday Eevee All Japan 10 November 18, 2016 to ??? Moves marked with a superscript game abbreviation can only be bred onto Eevee in that game. 51%-100% HP Want to take a chance on my evolution? 26%-50% HP Oh? My health is down by half already. It quickly dashes about and charges to attack. It shoots a series of hearts. Eevee often plays in the Granite Zone. He enjoys the Attractions Bulbasaur's Daring Dash and Absol's Hurdle Bounce! He is clumsy but very diligent. He is running a racecourse, following Flareon and others. 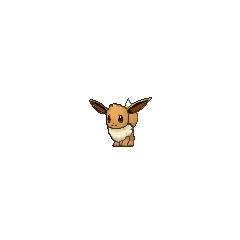 For other sprites and images, please see Eevee images on the Bulbagarden Archives. Eevee's name is a palindrome. Eevee is the only Pokemon to not share any types with any of its evolutions. Eevee has the most evolutions of any Pokémon and is the only Pokémon which has more than three evolutions. The fanmade term to describe the evolutions of Eevee, Eeveelutions, was made official after its use in the strategy guide for Pokémon Stadium 2, followed by a TCG Theme Deck. In early English promotional material for Pokémon Red and Blue, Eevee was called "Eon", the suffix of all the evolutions of Eevee. It is impossible for Eevee to evolve into Espeon and Umbreon in Pokémon FireRed and LeafGreen because the games lack a time system. It is also impossible for it to evolve into Leafeon and Glaceon in Pokémon HeartGold and SoulSilver since neither Johto nor Kanto has a Moss Rock or an Ice Rock. 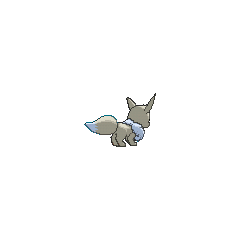 Despite Eevee being obtainable before the Pokémon League in Pokémon Black and White Versions 2, it cannot evolve into Leafeon or Glaceon until after the Elite Four are defeated. This is because Twist Mountain and Pinwheel Forest are inaccessible before then. 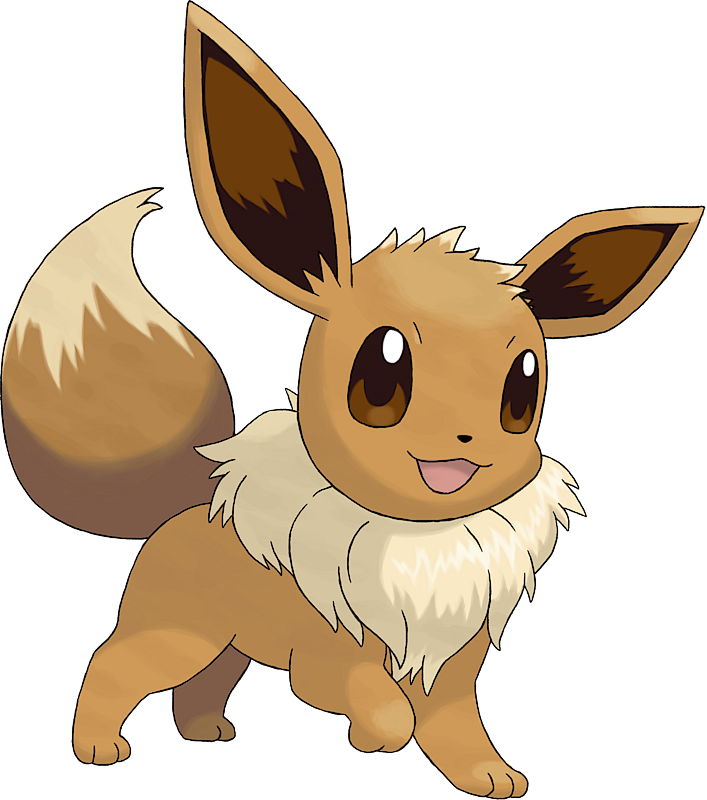 Eevee is the only pre-existing Pokémon to receive an evolution in Generation VI, though many received Mega Evolutions. Four of Eevee's evolutions evolve through abnormal means in the Pokémon Mystery Dungeon series (Espeon, Umbreon, Leafeon, and Glaceon). In the Pokémon Mystery Dungeon series, Eevee evolves using the Sun Ribbon, or Lunar Ribbon with at least 1 star of IQ, a Mossy Rock, or a Frozen Rock into its respective evolutions. In Pokémon Ranger, all of Eevee's evolutions up to the third generation can be captured; however, Eevee cannot even be found at all. This was changed in Pokémon Ranger: Shadows of Almia. Despite the fact that May, Gary and Sakura each owned an Eevee that went on to evolve, Eevee was never seen evolving on screen in the anime until Last Call — First Round! when Ursula evolved her two Eevee into Flareon and Vaporeon during a Contest appeal, over thirteen years into the series. Eevee shares traits with foxes, more specifically the fennec fox, dogs and cats. 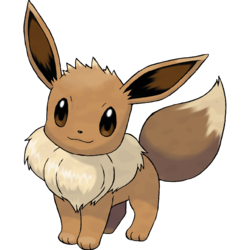 Eevee and Eievui are the pronunciations of E-V, the first two letters in the word evolution.